This is a leisurely route out of Nanjing City towards northeast to Yangzhou. Starting from the city center to the northwest, you will get to Liuhe District by crossing the Yangtze No. 2 Bridge of Nanjing. This 40-kilometer (25-mile) section is so easy to finish that you can spend the remaining time in exploring Liuhe. You could find the beautiful Rain Flower Stones in Xiongzhou Town and then taste the delicious crab dumpling in Longpao Town. Staying over in Liuhe, you will head to explore the charming Yangzhou City on the second day. Out of Liuhe, you could cycle along the direction of the National Highway No.328. This journey is about 60 kilometers (37 miles) and has few of food and water supply bust vast area of farmland and blooming garden. Upon arrival in Yangzhou, you could have an enjoyable cycling around the Slim West Lake and then look for some specials in this ancient city. Setting off from Yangzhou the next morning, you could take a ferry crossing the Yangtze River southward to Zhenjiang City and then have a short visit here. In the afternoon, please cycle back to Nanjing. Upon arrival in Suzhou lodge yourself in a local guest house and have a good rest. Then you can pay a visit to the Suzhou Gardens one by one. Firstly you can cycle to the Suzhou Museum, the Lion Grove Garden and the Humble Administrator's Garden. The three spots are in the same area. Proceed to the Folk Museum, then the North Temple Pagoda and the Guanqian Street. The second day will be followed by the visit to Pan Gate, the Lingering Garden and Hanshan Temple. On the third day, you should be prepared for a longer excursion after having a local breakfast in Suzhou city. The destination will be the Dongshan town which is about 40 km from Suzhou city, the largest byland on the bank of Taihu Lake. Dongshan town is featured for its natural scenery of the hill, the water, the flowers, the fruits and the ancient architecture of Ming and Qing dynasties. There are at least 10 places of interest for you to explore there. You can cycle along the Huanhu Road and the journey takes around 4 to 5 hours to reach the town. En route, you may slow your speed to appreciate the peaceful and magnificent scenery on the east shore of Taihu Lake. Upon arrival, cycle north to pay a visit to Qiyuan Garden, the Yuhua Resort and then transfer to the Yudetang Hall. Stay overnight at a guest house in Dongshan town. On the next day, cycle southwest to Luxiang old village which is famous for its well-preserved ancient street, the lane and over 30 architectures in Ming and Qing dynasty. 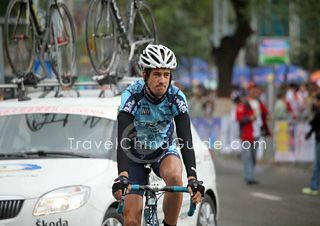 Proceed to Cycle south along the Huanshan Road and you will reach Lingyuan Temple and Xuanyuan Palace. Continue cycling to the Purple Gold Nunnery to see the painted sculpture and the last destination will be the Diaohua Floor. In the afternoon return to Suzhou city and have a good rest. 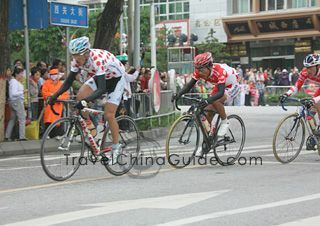 On the fifth day, you can extend your bicycle tour to Hangzhou city which is about 170 km from Suzhou city. The recommended routes are Suzhou - Wujiang - Jiaxing - Tongxiang - Yuhang - Hangzhou. It will be very tired if you try to make it in one day. You are advised to have one and a half day or two days for the whole cycling then you can have a tour en route and it can make the journey more relaxed. Upon arrival in Hangzhou, find a local guest house to have a good rest and get prepared. Then you can cycle to the famous West Lake area, the Six Harmonies Pagoda, Fei Lai Feng and Ling Yin Temple. Your bicycle tour ends here in Hangzhou. By taking this route, you will have an opportunity to visit an old town in South China, which has not been commercialized too much. After cycling in Suzhou Industrial Park, you can turn to north to take the National Highway No.312. Generally, it only takes about one hour to get to Kunshan City. 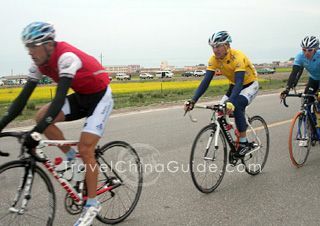 Having a short cycling in the city area and a lunch, you could continue northward to Qiandeng. It also takes about one hour in a leisurely speed. Then, you could spend several hours in exploring this old town. In the later afternoon, you should return to the National Highway No.312 again. It is about 40 kilometers (25 miles) from Kunshan to Shanghai, so it is easy for you to get to Shanghai for a night. Leaving from Wuzhong District of Suzhou to the south, you will arrive in Wujiang City after taking a 20-kilometer (12-mile) flat road. This section is stretching along the Grand Canal so that you could slow down the speed for an enjoyable cycling. Continuing to go with the road, you will pass by Shengze Town noted for silk product, Wangzhen Town of border of Jiangsu and Zhejiang, and finally get to Jiaxing City. This section is about 50 kilometers (31 miles) so that enough time will be left for you to explore Jiaxing. On the next day, you will have to finish 100 kilometers (62 miles) to get to Hangzhou along the National Highway No.320. Set off from Jiaxing in the morning, you will come to Tongxiang City which is about 30 kilometers (19 miles) to the southwest, passing by the well-know Wuzhen Town. If you would like to have a visit in Wuzhen, you could have a lunch in Jiaxing. Then, after a long cycling in the afternoon, you could conclude this journey at the West Lake of Hangzhou. 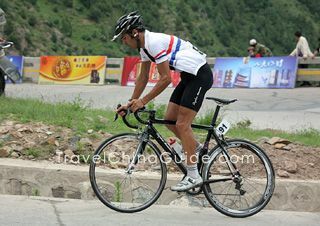 how much is Nanjing Bicycle Tours? We are sorry that the bicycle tour routes on our website is just for your reference and we don't provide relevant service at present. If you are interested in any of the itineraries, please follow it and arrange the tour by yourself. Please keep the safety in mind. Best regards~!